The apartment Emilie is located on the ground floor a large residential complex. 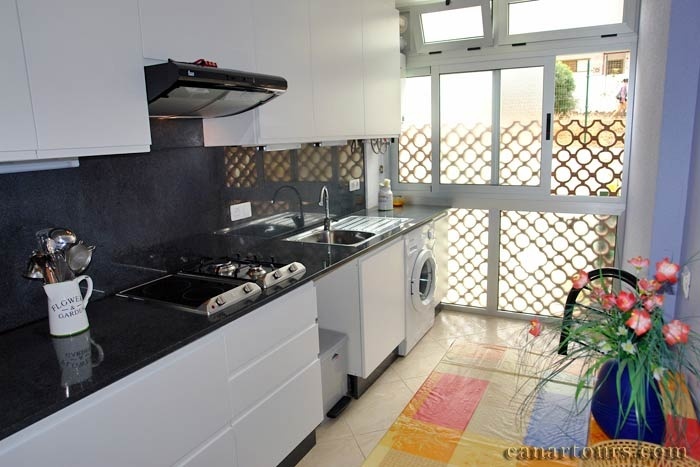 It is located about 1 km from the center of Los Cristianos but the location is very quiet. On The apartment Elena is the ideal apartment for people during the day to spend time by the sea and the swimming pool and in the evening welcome to walk or go to restaurants. A car is not necessary, since all the shops, banks , restaurants, the beach, ambulance, taxi and bus stops are close to the apartment. The apartment is spacious and comfortably furnished. The balcony faces south-east , and offers many hours of sunshine. The holiday apartment is approximately 60m ² and is divided into kitchen, living room with dining area, 2 bedrooms and bathroom with shower. The kitchen has a stove with 2 electric and 2 gas plates. Coffee maker, kettle , crockery are provided . The living room asking a comfortable sofa, satellite TV for the reception of German programs and dining table with chairs for 4 people. Both bedrooms have double beds (140cm x 190cm ) and fitted wardrobes. In addition, guests will find a washing machine, iron, ironing board. Bed linen and towels are Available. Smoking is not allowed in the interior. Price: The daily rent for 2 persons is 55 €. Each additional person pays 15 € per night to do so. In addition, cost of cleaning in the amount of a day's rent.